Due to a particularly high amount of Spirulina carotene and Haematococcus algae rich in astaxanthene, sera KOI Professional Spirulina Colour Food ensures unique colour depth along with clear separation of the colour zones and silky gloss. White patterns do not become unsightly yellow but remain bright white. High quality protein ensures balanced and healthy growth. The unique co-extrusion process allows combining differently treated ingredients. The ring contains high quality natural ingredients such as Spirulina and Haematococcus for unique colours and an appropriate diet. The core consists, among others, of essential vitamins, minerals and trace elements for healthy growth and a strong immune system. 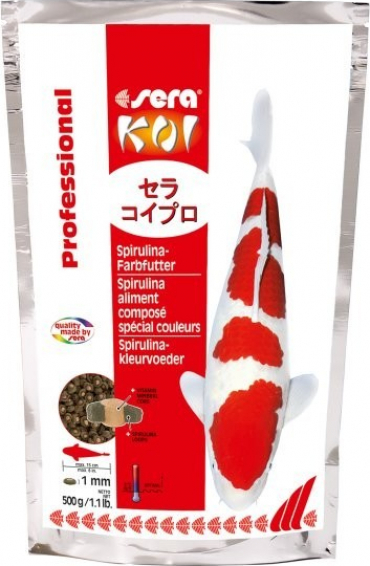 sera KOI Professional Spirulina Colour Food can be fed throughout the year above 8°C (46°F) water temperature.